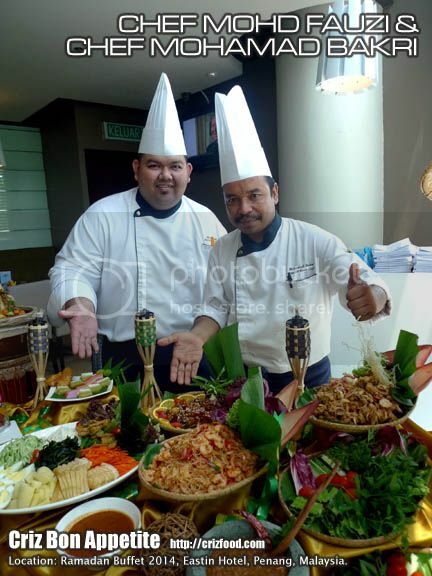 For the holy month of Ramadan this year, Swez Brasserie @ Eastin Hotel, Penang, would be having its Ramadan Buffet Dinner from 29 June until 27 July 2014 (6.30pm – 10.00pm). 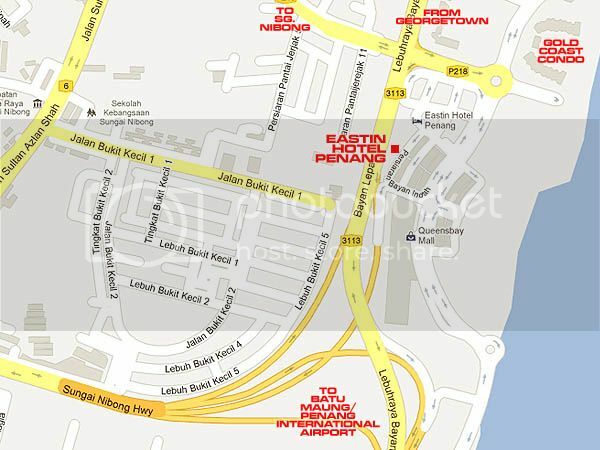 Price per head for adults would be at RM88++/pax while a child would be at RM44++/pax. 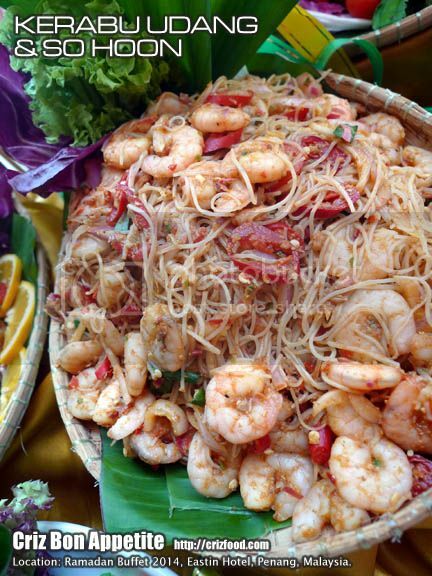 The Ramadan Buffet Dinner would consist of delicious authentic Malay cuisine the traditional kampong style under the experienced hands of the Jr. Sous Chefs, Chef Mohamad Bakri and Chef Mohd Fauzi. One of the more notable dishes for more energy and stamina would be their signature Sup Gearbox (牛骨煲汤), one great dish that I would always look forward to every year during their promotion. The spices and herbs used in slowly simmering the bull’s thigh bones combined with some potatoes and carrots were indeed “powerful”. A bowl of this heavenly dish would surely keep the body energetic and rejuvenated for any activities during the fasting month. 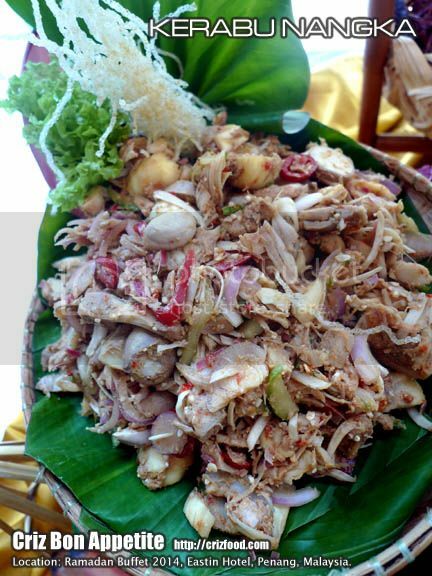 Another of the appetizers would be the Kerabu Nangka (Young Jackfruit Salad/凉拌菠萝蜜). The young jackfruits were specially cooked in such a way that the flesh remained tender such, almost similar to the texture of young coconut flesh. These would be then tossed with some ginger flowers, kerisik (toasted desiccated coconut), toasted belacan (shrimp paste), boiled chicken breast meat, etc, with a light squeeze of lime juice. I love the unique flavors a lot. The next dish which was the Kerabu Udang with So Hoon (马来式凉拌虾和冬粉) was something very appetizing. It had the similar spiciness and sourness as the former dish but with the tossing in of some glass noodles. 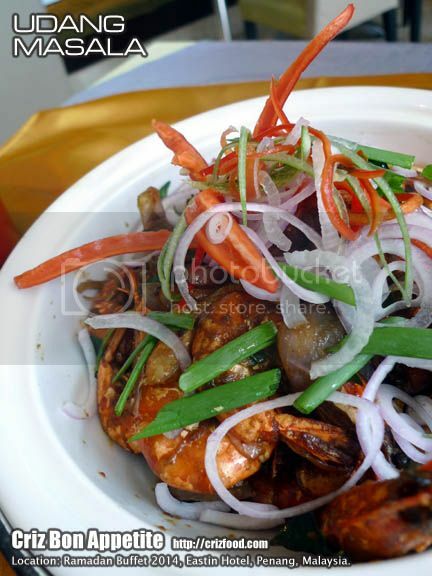 It was super delicious with the usage of juicy prawns in abundance. 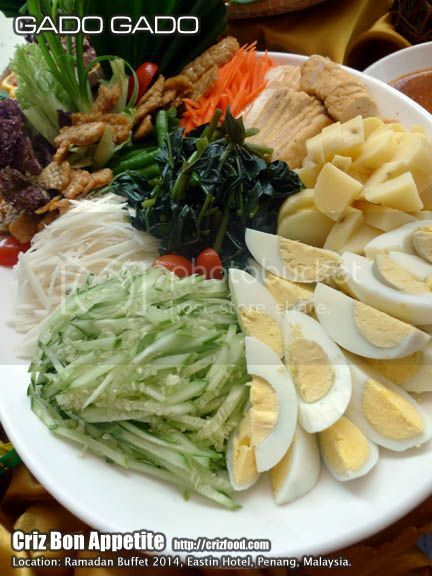 Next in the list was the Gado Gado (马来式冷盘), an Indonesia originated salad dish with thick and mildly spicy peanut base dressing. Instead of the usage of crackers, it had deep fried tempeh added as one of the choices. The crispy tempeh blended in real well with the rest of the ingredients. A “buka puasa” meal would not be complete without the Ulam-ulaman (assorted fresh greens/凉拌各式马来风味小菜). 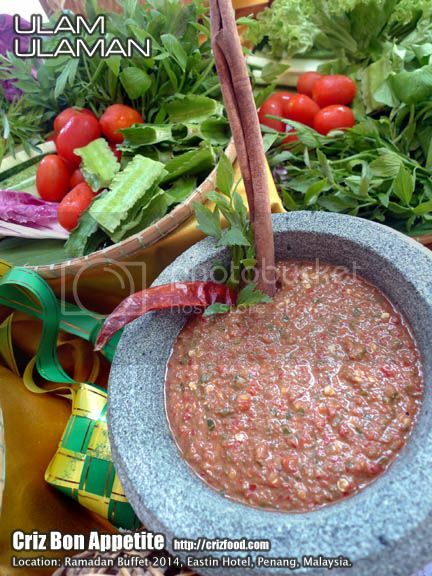 This combination of raw vegetables and herbs went well with the provided sambal belacan condiment. Occasionally, you might get other condiments such as the Sambal Cincaluk (Salted Baby Shrimps Sambal) and Sambal Mempelam (Mango Sambal). 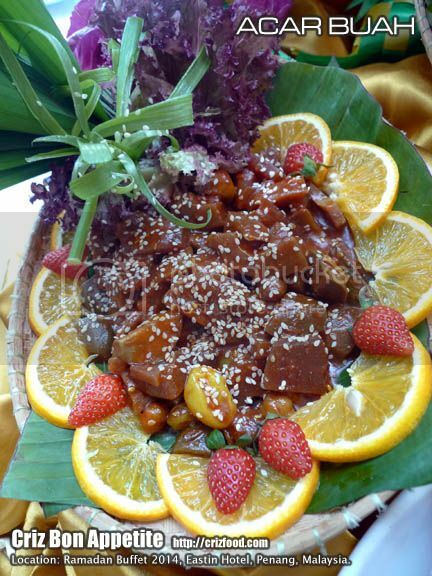 They do also serve Acar Buah (马来式甜酸水果腌渍), a Malay style of spicy sweet assorted fruit pickles. This pickle would go well with fried items especially fish. 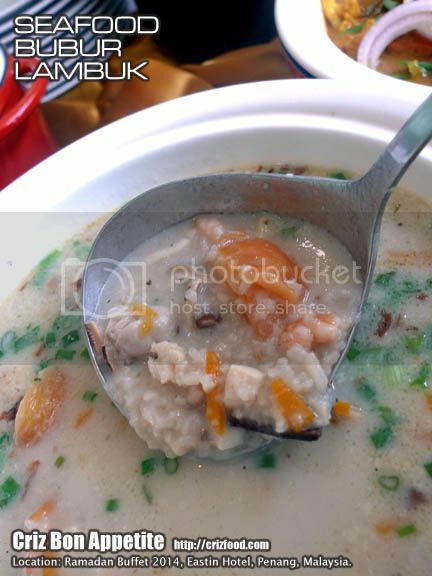 As for main course, you would get to try out their Seafood Bubur Lambuk (香浓海鲜椰浆粥), a porridge of various combinations, which contained coconut milk that would normally be distributed to the public for free by those surrounding mosques. 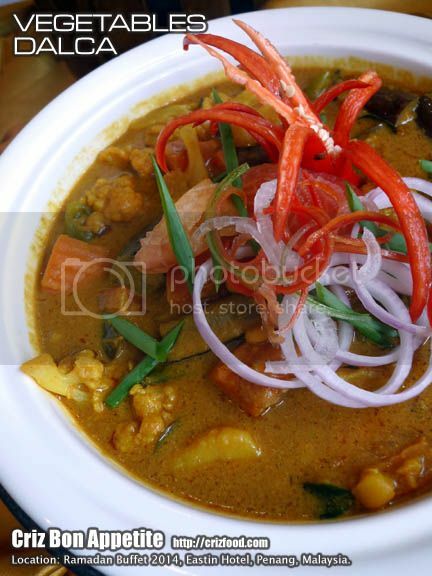 This version came with rich flavors from sliced prawns, squids, mussels and vegetables. For sure, you won’t want to miss out their Nasi Tomato with Raisins (Tomato Rice with raisins/葡萄干番茄饭). You can taste out the rich flavors from each rice grain with has fresh tomatoes, cloves, star anise, cardamom, curry leaves with chopped almonds, green peas and raisins as garnishing. 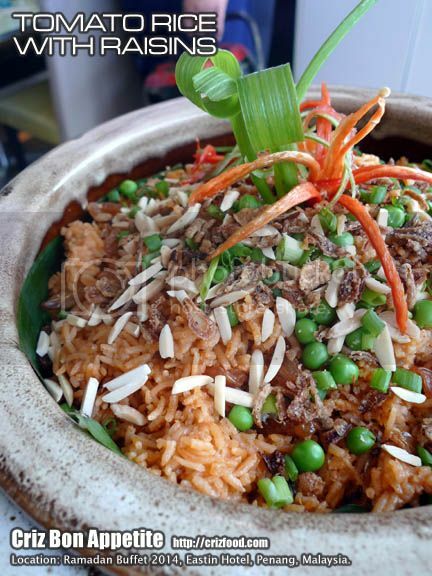 The tomato rice texture was fluffy with added fragrant from the toasted almonds and sweetness from the added raisins. Thumbs up! To go with the rice, there would always be some nicely pepped up meat dishes such as the Ayam Masak Merah (传统马来咖喱鸡), a traditional Malay red curry with tomato puree plus a combination of herbs and spices. 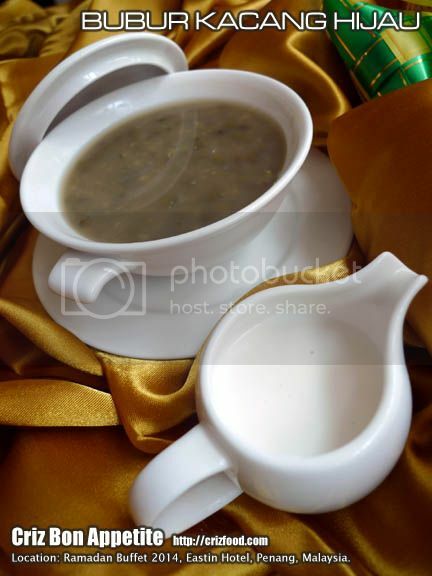 It had thick gravy which I love a lot from the usage of lots of blended onions. This dish is not spicy at all and would suit all ages. For seafood, we had the Udang Masala (马萨拉虾), basically prawns stir fried with chilies and spices with a light tad of sourness. 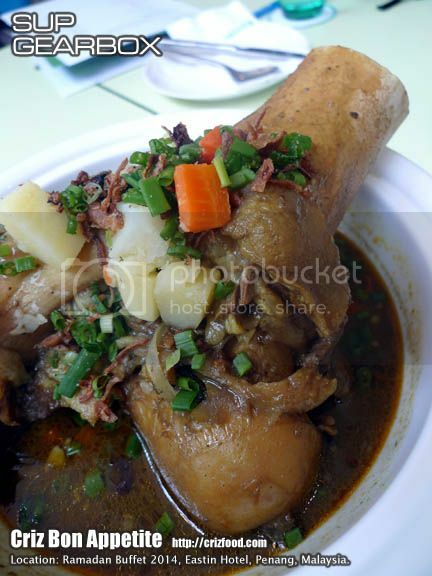 The dish was quite similar to those you see at the Nasi Kandar shops. Taste wise, I prefer another species of prawns rather than the hard-shelled prawns they were using. Sometimes, simplicity would surely rule. I immediately felt in love with their Vegetables Dalca (咖喱扁豆蔬菜). This popular Hyderabadi dish, in which contained lots of dal, spices and vegetables, slowly simmered to get the full richness of the pulses, complimented truly well with just any type of spiced up rice such as the tomato rice, nasi briyani or plain steamed rice. 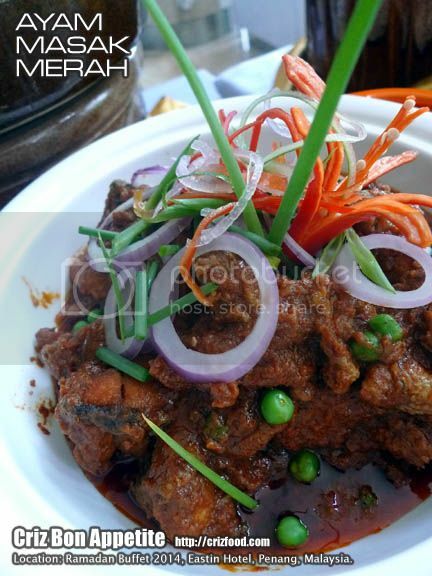 For lamb and mutton lovers, do watch out for their Gulai Kambing Kerutuk Pantai Timur (马来式东海岸闷羊咖哩). 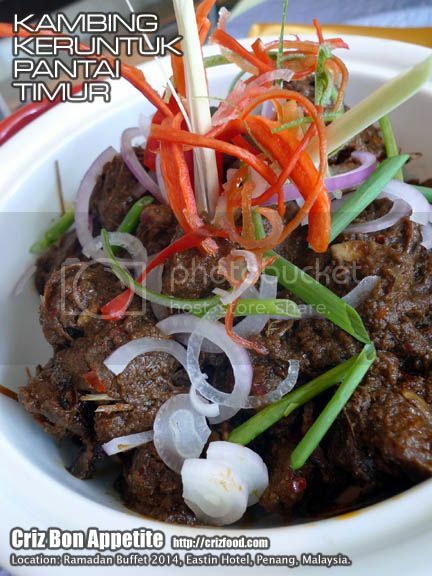 Not many people outside Kelantan had tasted this delicious lamb dish which is a big sweeter than the sister-like rendang as it uses gula Melaka or brown sugar in the recipe. 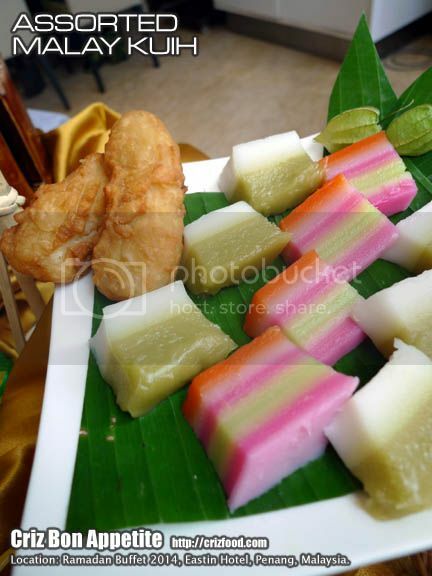 As for dessert, we had an assortment of Malay Kuih (各式马来糕点) which would be served based on availability. 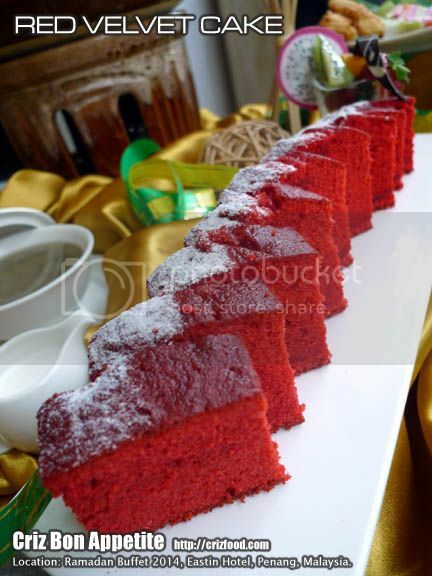 They would also be some Western cakes added into the menu such as the Red Velvet Cake (红丝绒蛋糕). I’m sure you would like to try it out as it would be made by their in-house experienced pastry chefs. Bank Islam credit and debit card members are entitled to a 15% discount of total bill during Ramadan Buffet Dinner (Monday – Sunday, 6.30 pm – 10.00pm) while Citibank and Maybank credit and debit card members can enjoy a Pay for 5 persons and the 6th person dines for FREE during Ramadan Buffet Dinner (Monday – Sunday, 6.30 pm – 10.00pm).